The European-built Tunturi E80 upright bike is loaded with quality, comfort, and an attractive and unique Scandinavian design. The Tunturi E80 upright bike has a console with a full color 7'' display that is easy to use with just four push buttons and a selection wheel. You can pick from over 100 pre-set programs including constant Watt, constant HRC, RPM, T-Ride™, T-Road™, T-Music™, race, fitness test, and more. Every program has a recognizable symbol. UPDATE: The E80 is no longer available. Check out the latest models on the Tunturi website. 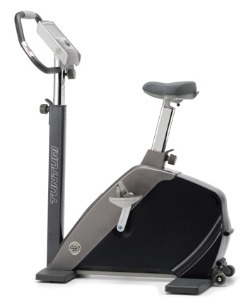 Known for its variety of programming, the Tunturi E80 upright features 126 training modes that includes preset programs, user defined programs, heart rate control workouts, quick start, manual, and three Tunturi-unique programs: T-Road™ for bringing the outdoor road bike experience to indoor training, T-Ride™ programs for a realistic speed simulation of outdoor cycling, and T-Music™ programs for a motivating beat for workouts. The Tunturi E80 features an electromagnet brake with a silent operation, a large flywheel, an easy mount frame, and multiple adjustment points on the seat (height, horizontal and tilt), handlebars (angle and height) and monitor (tilt). Tunturi exercise bikes offer comfortable pedals that can be used even without wearing shoes. Reviews on Tunturi models point out that they are highly regarded for their engineering, quality and ergonomic fit. Currently, the Tunturi E80 upright bike sells in the US for around $2,000, which makes it much more expensive than comparable bikes that are either built in the US or imported from China. Due to the weak dollar, you may be spending too much on a Tunturi when there are many brands of equal quality that sell for much less in North America.